Who has ever thought of doing a magnanimous cause to save the environment? What’s in it for me if I do something for mother nature? Who will care? Will others get to notice it? Why must everyone do his/her part to commit to a life changing work? The truth is, everyone must care. THE IDEA of saving the environment might not sink in to some just yet, but there is a digital tool that can help us understand more what this is about and how we can take part (in our own little ways) to save energy and maintaining our environment clean and healthy. 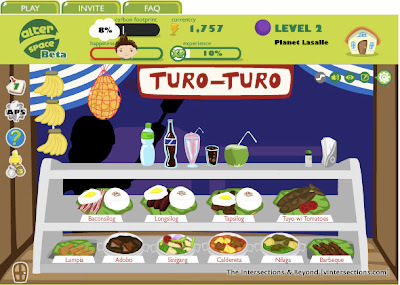 Alter Space is a newly conceptualized game made by Filipinos that teaches people (both children & adults alike) how to contribute to the preservation of our Mother Earth. This game can be played on Facebook by downloading its application on one’s account. Facebook has invaded the everyday consciousness of many Filipinos and countless people across the globe. People want to update everyone in his/her network of what’s going on with their lives, and what they’re thinking about. Alter Space can be a part of one’s mission to learn something for our environment. 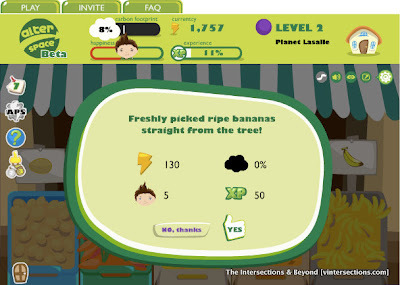 Some friends I know only registered an account in Facebook, not to connect with friends, classmates and relatives, but just to play games on the said network. “Alam mo ba kung bakit lang ako nag-Facebook? Para lang maglaro. Pag may nag-aadd na kilala ko, accept ko lang. Pero, wala akong pakialam sa kanila,” shares Timothy dela Cruz, husband of my cousin Joyce Sy-dela Cruz. When his contacts would ping him for chat, “di ko pinapansin ang mga yun, kahit close friend ko pa. Nagagalit nga sila sa akin e. Kung gusto nilang makipaglaro, ah... ibang usapan na yan! Game tayo diyan!” Timothy asserts. This guy just proves how a game addict he truly is, to play online games for hours continuously. Because of the community of gamers on Facebook that continues to thrive, it is just apt for Alter Space to be where the people are. As a matter of fact, the Philippines is the 5th largest country user on Facebook and the Philippines is the 4th among the top growing Facebook countries in the World today. In January 2011 alone, 1.5 million new users signed up on the biggest and the fastest growing social network site in the world. This is according to the first infographic of Yehey! released in January 2011, that mentioned www.socialbakers.com as its source. How does Alter Space work? 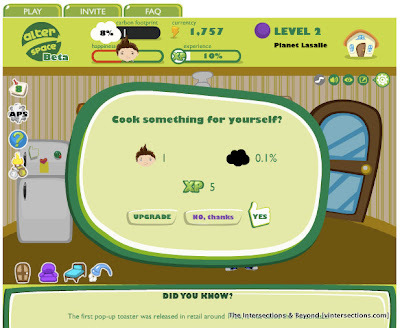 THE GOAL of this game is to take care of the planet that you’ll be creating. 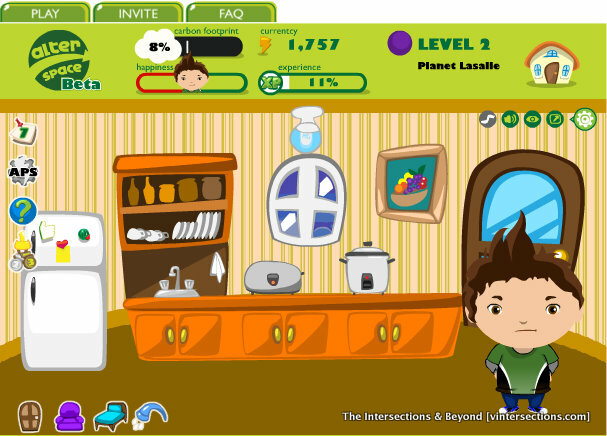 [For my planet, I have created "Lasalle." Now, you can tell how "green" my heart is.] There are metrics that are used to measure the effects of every action. Carbon footprint levels must be kept at the lowest, while making your Happiness level up. Based on the DSM website’s definition, a Carbon Footprint is the impact of a certain activity on the emission of CO2 to the atmosphere. 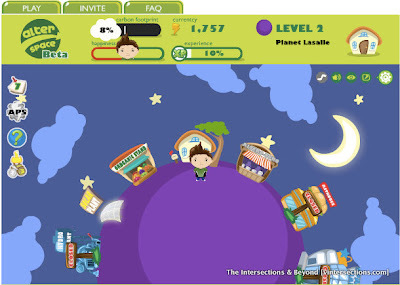 For every action (based on the fun tasks assigned) that you take in your planet, Experience levels go up, and Currentcy Level can also go up or down . When your Experience level reaches 100%, then you move on to the next round. No matter how well you perform in Experience, Currentcy level also changes. The amount under Currentcy can be used to purchase food, items or appliances within your planet. Therefore, every choice you make can directly or indirectly affects our environment. The way Alter Space game was conceptualized just blows me away. Because this game teaches us 3 things: practicality (what we can do everyday based on our needs and wants), values (the way we treat others and things in the community/planet), discipline (some of the things we can do in the game are limited only in a day to earn valid points). 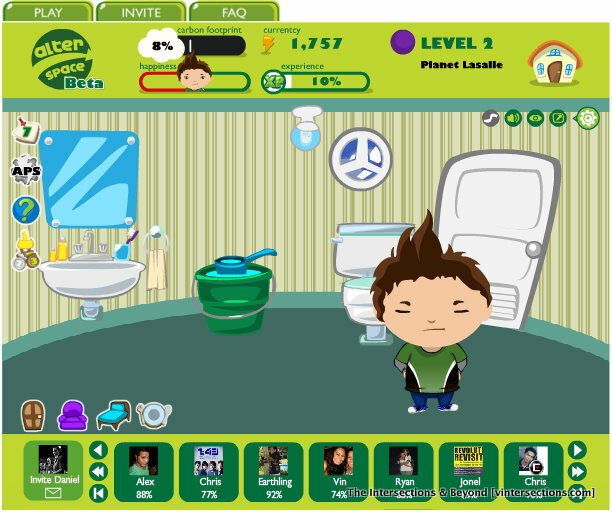 ALTER SPACE is a Facebook game developed by Cleanergy of AboitizPower. AboitizPower, Philippines' major producer of Cleanergy (a brand name for cleaner and renewable energy), hopes that the game "can reach out and educate people on how they can lower their carbon footprint and help preserve the Earth's resources." Azkal's Anton del Rosario encouraged every individual to take part in this online game because we will learn a lot from it. "People need to learn how to save energy, how to recycle, and to cut down on the things that aren't necessary," the football player believes. A renowned cosplayer and avid gamer herself, Alodia Gosiengfiao finds Alter Space to be both an enjoyable and challenging game to play. "The great thing about Alter Space is that it's not just a typical game that you play. In a creative way, it teaches people to be conscious of the carbon footprint they (can) produce, which means changing their habits for the good of the Earth," says Alodia. WHAT MAKES Alter Space distinct is its Filipino-ness in content. Some items and terms are distinctly Filipino. You'll see sungka in the living room. You buy combo meals at a Turo-turo, like Longsilog, Tapsilog, Adobo, Sinigang, Caldereta. Practical environmental tips are also included, like: "Fix leaky faucets in your home. A drop per second can amount to 200 gallons of waster water in a month!" Trivia can also be learned: "The first pop-up toaster was released in retail around 1926. It was called the Toastmaster." 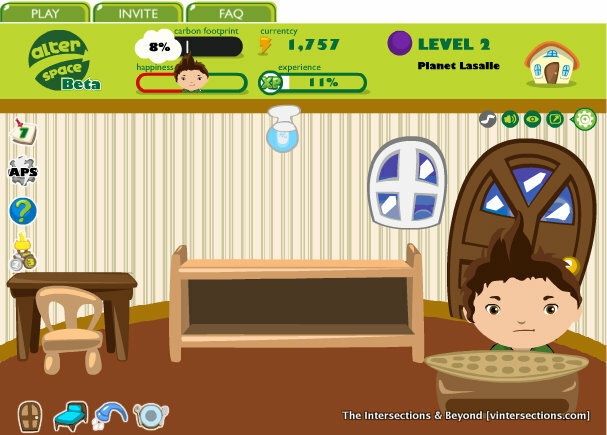 Alter Space is not only fun and entertaining to play, but very educational and environmental as well. WHEN I was in first year high school, Ms. Edquiban, our Values Education teacher, discussed to us how we can help save the environment. She started off by asking the class: "What simple things you think you can do to help in the house?" Some students answered: "Sweeping the floor," "Wash the dishes," "Help mother cook," etc. Then Ms. Edquiban went on to ask about the main topic for the day: "What are the things you can do to save on electricity?" I remember very vividly, I raised my hand first. "Ma'am, pag may brownout, dapat pong tanggalin ang lahat ng mga kableng nakasaksak at i-ooff po natin ang refrigerator sa zero," was my answer. I was anxious when the teacher asked the class and rephrased my answer, "Class, is Arvin's answer true or false? That when there is brownout, we take out all the plugs in the house? Does that save electricity?" A few of my classmates replied in unison, "No......." Ms. Edquiban was not satisfied of the class' knowledge so she wanted to see the percentage of what the class believed to be correct: "Class, who said Arvin is correct?... Who said Arvin is wrong?... Who said I don't know?..." It was surprising though that some raised their hands for the last option. Doubts clouded my face that very moment. But then, our teacher gave an approving remark for my answer that day. I felt so relieved! That started a very meaningful discussion and we learned so many things on how we can truly help the environment in our own little ways. Kids can learn the value of things through discipline. My short essay, "The Missing Left Rubber Shoe" is a true story how my prep student lost his shoe and how students at ages 5-6 are taught the value of order and cleanliness. (1) Turn off the lights and other appliances when not in use. (2) Do not plug in so many wires in one socket. (3) Use fluorescent lights instead of light bulbs. (4) Defrosting our ref and freezers when thick ice starts to build up because it consumes more power. (5) Open the windows to breathe in fresh air, rather than using the airconditioner all the time. 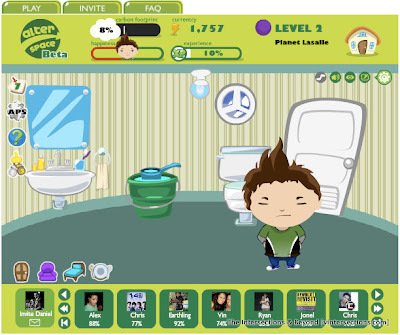 Some of these tips can be seen in the game, Alter Space. By playing this game, children & adults alike can learn a lot. Everyone will be conscious in choosing the next move - will the action benefit our environment, or will it contribute to its destruction? The choice --- is in your hands! Make a change now!